The piece has been excellently directed by William Nigh, who, in the excitement attending the Big Fuss in the bay at Singapore, has not neglected to obtain some beautiful exposures of the adjacent Oriental seascape. Or was it really Los Angeles, harbor? Not everyone was as convinced of the film’s realism as the Livonia Gazette editor, however, as this acerbic review suggests. The main gripe? Joan Crawford’s attire. 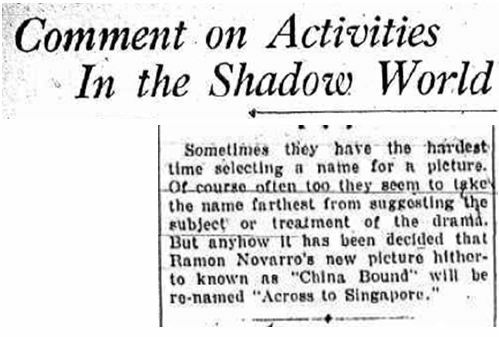 Singapore (and its fishes) is nowhere in the film other than in the title, but even that seemed to be incidental, as this short article from the Schenectady Gazette indicates, the initial title was ‘China Bound’. 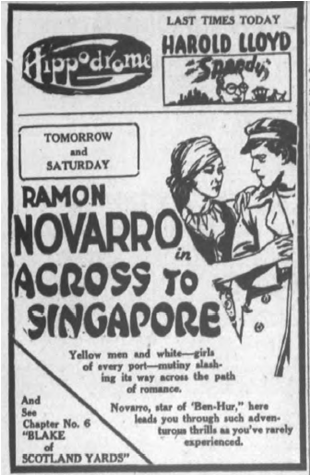 Perhaps Singapore’s reputation as ‘Little China’ was already in existence even in the 1920s, with Hollywood directors confusing the two. Catch the screening of Across to “Singapore” in the NUS Museum on 23 January to see the imagined Hollywood “Singapore” for yourself!